Like I already said, it's gotten incredibly cold in Finland in the past week or so. What made it even worse was leaving 22C in Munich and landing in a 9C Helsinki that same evening. Even my leather jacket isn't enough to keep me warm in the mornings when the temperature is just barely on the plus side of the scale. Still, I refuse to go fish out my winter coats and wear them. So what now?! Well, my grandparent's happened to have a garage sale this weekend, and I stopped by yesterday for a while (and saw my little cousins and my aunt and uncle who I haven't seen since we left for Munich in May, probably?!). 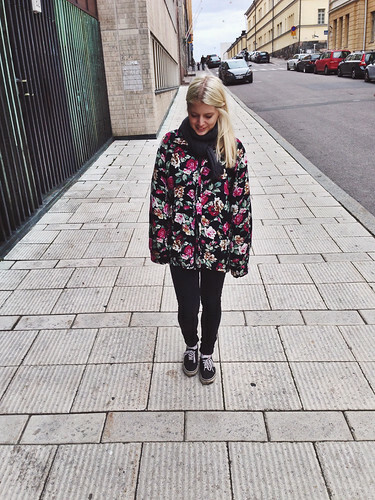 This amazing floral coat happened to catch my eye, and I got to take it home --- for free! It is the perfect thickness for this weather! It's thicker than my other fall jackets since it's got a bit of a lining, but it's not as thick and overpowering as my winter coats. And I'm in love with the pattern! The shape and the size are amazing as well, and it doesn't have anything extra on it that would ruin its perfectness. Score. Also love the HDR setting on the new iOS 7. You can actually see the clouds and the blue sky in the last pic. Cute! Niiiin sun tyylinen. Tsemppiä lukemiseen. I LOVE your coat, especially the fact, that the pattern is typical for autumn or winter. schöner blog. 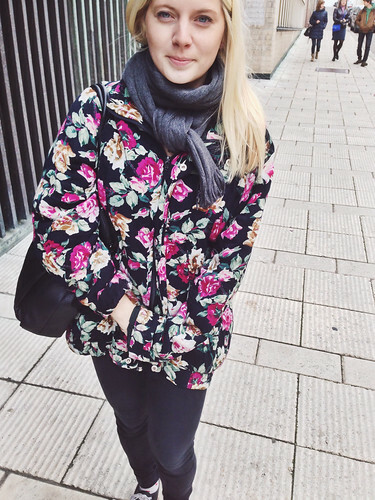 deine jacke gefällt mir gut.